See the details of this incredible love story. For Peter Bilello, life changed forever over 50 years ago when he went to visit his mother in his native Italy. "My mother, she knew this girl," Bilello, 86, told ABC News today. "And my mother says, 'Why don't you get married.' ... She don't know me, I don't know her." Forty days later, Peter, then 35, and the young woman named Grace, then 23, wed in Italy. In September 1964, the couple moved to Connecticut, where Bilello lives now. They had two children and four grandchildren. "She was a very good wife, very good cook, very good mother," he told ABC News. "Wherever my wife would go, I go." In 2001, Grace was diagnosed with cancer, Bilello said. She underwent an operation, chemotherapy and radiation. "I thought it was going to be OK," he said. 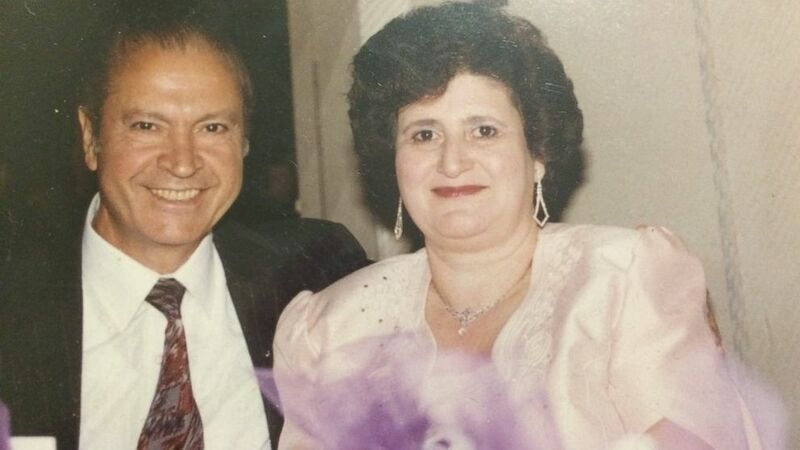 (Courtesy Bilello family) Peter and Grace Bilello were married for 50 years. But three years later, the cancer came back and she went through more chemo and radiation. "Me and my wife were together all the time," he said. "She goes to chemo, I sit down next to her. And coming home, she lay down on the couch, she's very sick after the chemo and [I] do all the work in the house." Then several years ago, in 2009, Bilello came up with a fun idea: He and his wife would each sign a dollar bill. "I told my wife, 'I'm going to sign one on the front: Peter B. I want you to sign one, too, for Grace B.,'" he said. "I put those 2 dollars in my wallet." The bills stayed there for a year. Then, about five years ago, "By mistake I went shopping," he said. "I don't know where I used the 2 dollars. I came home and told my wife... 'Grace, I made a big mistake today. ... I'm never going to see [the dollars again].'" 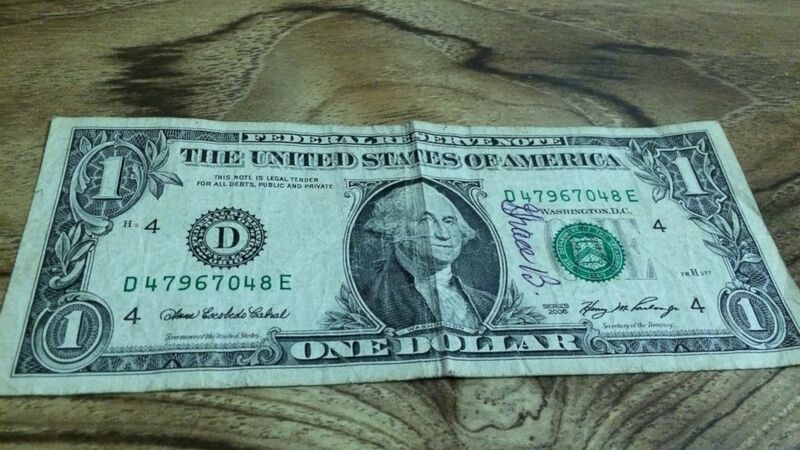 (Courtesy Bilello Family) Peter Bilello, a widow, accidentally spent this dollar bill signed by his wife Grace. Years later, he got the bill back. The bills may have been gone, but the couple's love kept going. In 2014, they celebrated their 50th anniversary. In November 2014, after 13 years as a cancer survivor, Grace died. "I was close with my wife," Bilello said. "Anything she said, I would take care. Doctors, hospitals. I was with my wife all the time. And it made a lot of difference... for sick people to have support of the family." "I was very supportive of my wife, that's why she lasted 13 years," he added. Then just weeks ago, Bilello took his granddaughter, Ashley, to a sandwich shop for lunch. He gave her a $10 bill, and when she came back from the store, she handed him 3 single dollars as change. 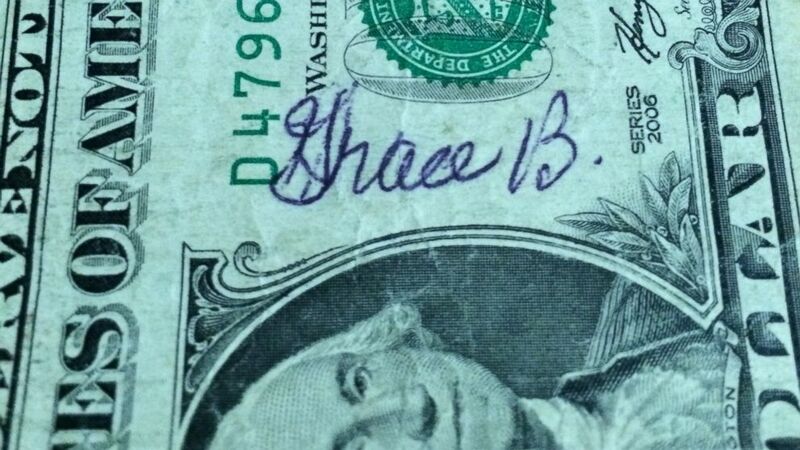 The second dollar he recognized -- it said "Grace B." "I said, 'Oh my god, Ashley, look.' We started to cry," Bilello said. "We were so happy to get the dollar back. I never thought I'd get that dollar back." Ashley, 14, said, "I didn't see it at first because I was just giving him back the change. Then when he showed me, at first you didn't believe it, but you still wanted to. But then when he got home, you can look at the signature to see how they matched up." Bilello said, "I told my granddaughter, we're going to go straight to the cemetery, and tell nonna [grandmother in Italian], my wife, that we got the dollar back. I showed the dollar to my wife and said, 'Grace, look, I got your dollar back." "It's a miracle to get it back after 5 years," he said. "Who knows how many million people got that dollar in their hands." He credits Grace with making the miracle happen. "It happened to be ... the right time and right place," Bilello said. "Nothing like this could happen. It's got to be a miracle." Now the dollar is in a safe place. "Nobody's gonna get that dollar anymore," Bilello said. "No way." And for the dollar he signed himself, "Who knows there it is," Bilello said. "I'd be happy to get my dollar back."